Calibrating is necessary to ensure the meter’s display produces accurate readings. Calibrating is conducted using standard pH buffer solutions which are made to internationally agreed recipes. These are stable solutions that possess a specific pH value. 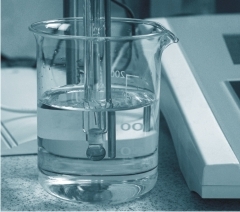 It is essential to calibrate using at least two pH buffers. These need to differ in pH by at least three pH units over the pH range being used. For nutrient solutions, pH buffer 4.0 and 7.0 are the ideal calibration standards. Some manufacturers claim that their pH meters require calibration using only pH buffer 7.0. Professional practice however, stipulates using two buffers because this will confirm or otherwise that the correct calibration “slope” is being obtained i.e. that both the electrode and meter are ranging correctly. Use experience as a guide for the required calibration frequency. Step 1. To prevent contamination of the stock pH buffers, decant a small portion into a small, narrow container for the calibration procedure. Discard this once used. Step 2. Rinse the electrode in distilled water and gently shake off the excess water prior to placing it in the pH buffer solution. Step 3. After calibrating, remove the electrode from the pH buffer solution, rinse with distilled water and return it to the storage solution.